To Cite: Ghoulami-Shilsari F, Esmaeilpour Bandboni M. Tele-Nursing in Chronic Disease Care: A Systematic Review, Jundishapur J Chronic Dis Care. 2019 ; In Press(In Press):e84379. doi: 10.5812/jjcdc.84379. Context: Telenursing is considered as a part of telemedicine, and based on the definition, the nurses managing the health needs of the patients is all done by information and communications technology. Evidence Acquisition: We searched from SID, Magiran, Irandoc, as well as the international banks Web of Sciences, Scopus, PubMed, Science Direct, Cochrane, Embase, Online Library Wiley, Ebsco, CINHAL, and the Google Scholar search engines. Moreover, manual search was performed for more papers. All internal and external published articles were searched on all databases and reference sites. After searching 250 papers, including 178 English papers and 72 Persian papers, 15 papers that fully matched the subject remained, with eight being Persian papers and 7 English. Results: From the 15 studies examined, one study had selected its patients from among the ones with a heart valve replacement surgery, seven studies had examined the effect of telenursing on diabetes control, and three cancer patients who targeted two patients with breast cancer and one patient with lung cancer. Among the studies examined, one study examined the effect of telenursing on self-confidence among patients with chronic lung blockage and one studied the effect of telenursing on self-efficacy in elderly with hypertension. All studies dealt with nursing interventions, such as training and empowerment as well as follow-up programs on the telephone or mobile and in one case, use of video call, with no medical care provided to the patients. Conclusions: Examining the studies shows that telenursing has been effective in changing the symptoms related to the patients’ health. Hence, telenursing technology can be used in clinical areas to enhance mental health and education as well as promote self-care behaviors. Telenursing is an effective method in nursing performances, such as educational, clinical, psychological, and economical aspects. Nursing is a combination of science and art (1). Nurses are the largest group of healthcare systems able to place effects on the quality of the health care provided (2, 3). One of the methods enabling the nurses to train to upgrade their nursing services and reach the welfare of the patients is telenursing (4). Telenursing is considered a part of telemedicine, and based on the definition, the nurses meeting the health needs of the patients is by information and communications technology (ICT) (5). Telenursing presents a device for providing continuous care in patients with chronic conditions. Thus, the patients can receive care-giving information without long trips in high quality and low travel cost (6). Telenursing is an ICT for providing nursing care (7), which can be provided by a variety of applications, such as the use of monitoring systems, the Internet, video, telephone, e-mail, and video images (5). Here, the most basic form of electronic healthcare communication can be an important and valuable aspect in patient care programs (8). The telephone is a simple device available to the majority of the population and is excessively used (9). Nowadays, more than 36 million Americans use telenursing. They argue that about 70% of nursing care and even medical care is possible through telecommunications technology such as the telephone and the Internet (10). The Canadian government considers access to telenursing as necessary for the whole population of the country due to the fact that it defines telenursing as a safe way in which the patient can communicate overnight and receive counseling at the lowest cost and only with telecommunications devices (11). Telenursing reduces unnecessary traffic and improves the quality of nursing activities (12). The composition of the world population is changing with the advances in medical knowledge and amazing technologies of the today's world accelerating this trend, thus, increasing the life expectancy as one of the consequences of this advance and rapid development, which has increased the number of the elderly. In the next 40 years, the population over 65 will double in the world, of which 52% will be in Asian countries and 40% in the advanced countries (13). Increase in life expectancy as well as reducing fertility in the world has led to an aging phenomenon in the world and in Iran. According to the World Health Organization (WHO) statistics in 2000, about 600 million elderly people lived in the world, reaching 2.1 billion in 2025 and reaching 2 billion in 2050. According to the 2011 census, more than 8.2% of the population of Iran is comprised of people aged 60 and over (14). Studies show that about 60% of health care costs, 35% of hospital clearance, and 47% of hospital admissions are for the elderly (15). Currently, the number of deaths due to chronic and aging diseases is increasing. The cost and duration of treatment for chronic diseases was 20 to 30 times more than the acute one, thus, telenursing can be the most cost effective caring method (16). Telenursing is used in different populations including the chronic diseases, aging, children and rural population, sanitation and emergency centers, as well as specialized clinics (17). Increase in the scientific knowledge of the nurses in telenursing enables them to help their patients to target their own self-care and function level (18). Despite the important of telenursing in the care of chronic disease, there is no study in this area in Guilan, which is the eldest province. As chronic diseases are increasing particularly in the elderly and since the use of telecommunication technologies, especially the telephone, to track and care for chronic diseases is cost-effective; this study was aimed to introduce telenursing as a method of nursing care and its effect on the control of chronic diseases. The study was conducted for the systematic review of the papers examining the use of telephone follow-up (telenursing). The main inclusion criterion was evaluating the use of telenursing as a nursing care with no time constraints considered for the search. The exclusion criteria were (1) using communication technology as non-nursing care and other groups, (2) non-relation to the subject matter, (3) letter to the editor and qualitative ones, and (4) repetitive papers. Using the Persian keywords and their English equivalent in Mesh, which were "Telenursing", "Care", "Chronic", "Technology", "Nurse", as well as a combination of them, we searched in the Scientific Information Database (SID), Magiran, Irandoc, and the international banks Web of Sciences, Scopus, PubMed, Cochrane, Online Library Wiley, CINHAL, and the Google Scholar search engines by the year 2018. Moreover, a manual search was performed for more published paper. All internal and external papers were searched on all databases and reference sites. After searching 250 papers, including 178 English papers and 72 Persian papers, 15 papers had the inclusion criteria (with eight papers as Persian and seven as English) and were selected for analysis. The procedure to selecting the papers is shown in Figure 1. From among the 15 studies examined, one study had selected its patients from among the ones with a heart valve replacement surgery; seven studies had examined the effect of telenursing on diabetes control (46%), and three cancer patients (20%) who targeted 2 patients with breast cancer and 1 patient with lung cancer. Among the studies examined, one study examined the effect of telenursing on self-confidence among the patients with chronic lung blockage and one study of the effect of telenursing on self-efficacy in elderly with hypertension. All studies dealt with nursing interventions such as training and empowerment and follow-up programs on the telephone or mobile and in one case use of video call, with no medical care provided to the patients. In a semi-experimental study, Zakerimoghadam et al. investigated the effect of a telephone follow-up by the nurse (telenursing) on the compliance of a diabetic diet in type 2 diabetes patients with data analysis done using descriptive statistics and statistical tests such as chi-square, independent t-test and paired t-test in SPSS 13. Chi-square test showed statistically significant differences (P = 0.035) between two intervention and control groups in adherence to the diet after the intervention and independent t-test after the intervention showed statistically significant differences (P < 0.0001) between the two groups in terms of glycated hemoglobin. The results showed that a telephone follow-up by the nurse leads to improved compliance with a diabetic diet and reduced hemoglobin glycosylated levels in patients with type 2 diabetes (9). A study by Sadeghi et al. for comparing the effect of telephone and SMS follow-up on the quality of life of patients after heart valve replacement surgery showed that the mean scores of quality of life dimensions after intervention in all three follow-up groups - telephone, SMS, and control - decreased (P = 0.027), (showing better quality of life), however, ANOVA showed no significant differences between the mean score of quality of life in the groups before and after the intervention (P < 0.001) (19). Shojaie et al. conducted a study to investigate the effect of patient education and telephone follow-up by nurse on remission, anxiety, and hope in patients with heart failure. The results showed a significant reduction in the number of hospitals, clinic, and hospital visits (P = 0.006) (P = 0.000) (P = 0.000) among the groups. Before the intervention, there was no significant difference between the anxiety means in the three groups (P = 0.168). After the intervention, there was a significant difference between the anxiety means in all three groups (P = 0.000). Additionally, there were no significant differences among the three groups in the hopefulness (P = 0.354) before the intervention (P = 0.354). There was a significant difference between the hopefulness meanings among the three groups (P = 0.004) (20). Another study by Imani et al. entitled “The effect of nursing informing through telenursing on the family anxiety level in patients admitted to the intensive care unit” was a semi-experimental study. In this study, the Wilcoxon test showed a statistically significant difference between the mean of anxiety before and after the first call, before and after the second call, before and after the third call, and before and after the end of the intervention (P < 0.001). Before intervention, the mean of anxiety in the samples was 71.47, which decreased to 69.35 after telephone intervention. In addition, before telephone intervention, the highest mean of anxiety was observed in men (P < 0.001), however, after the end of intervention, this mean was more in women (P < 0.001) (21). Another study was performed by Wong et al. (22), which was entitled “The effect of telephone follow-up by nurses on the degree of self-esteem of patients with chronic obstructive pulmonary disease” in Hong Kong. The results showed a significant increase in self-esteem score in the post-test in the intervention group compared to the pretest (P < 0.01). However, there we no significant increase in self-esteem score in the control group. Furthermore, there was significant difference in total self-esteem score between the two groups in the post-test (P = 0.03). In addition, during the three months, a significant difference was seen in the number of the subjects to the emergency department due to respiratory problems between the intervention and control groups (P = 0.03). However, there were no differences in the number of hospitalizations in the hospital due to respiratory problems between the two groups (P = 0.18). The conclusion of this study showed that telenursing could be effective in increasing the self-belief of the patients with chronic obstructive pulmonary disease (22). Fakharzadeh et al. conducted a study for determining the effect of telenursing on glycosylated hemoglobin and anthropometric indices of type 2 diabetic patients. Their results showed that the mean glycosylated hemoglobin and body mass index (BMI) in the case group after the intervention significantly decreased before intervention (P > 0.05), however, no significant differences were in the control group (P < 0.05). The mean of waist-to-hip ratio before and after intervention in the case and control groups was not significantly different (P = 0.70 and P = 0.40, respectively). The results showed that telenursing could be effective in hyperglycemia control (23). Another study by Behzad et al. (24), was conducted to determine the effect of telenursing-based empowerment program on self-efficacy in the elderly with hypertension. The result of the independent t test showed no significant difference between the level of self-efficacy before intervention in the test and control group (P = 0.44). However, there was a significant difference between the test and control groups in the level of self-efficacy after intervention (P = 0.001). The conclusion of this study showed that telephone interventions (telenursing) can increase the effectiveness of elderly self-efficacy (24). Another study was conducted by Tricia et al. (2014), for the first goal to carry out telephone follow-ups (telenursing) by the nurses for patients diagnosed with lung cancer. The results showed the establishment and feasibility of telenursing in rural areas. Telenursing in patients diagnosed with lung cancer increased the patients' satisfaction in reducing symptoms of illness and promoting their mental condition. The patients before and after the intervention (telenursing) felt these differences: dyspnea (60% versus 33%), fatigue (80% versus 67%), limitations in daily activities (80% versus 67%), pain (60% versus 33%), cough (80% versus 33%), difficulty in movement and walking (80% versus 33%), anxiety and frustration (40% versus 33%), as well as lower appetite (80% versus 33%). The results showed that telenursing technology could be seen as effective in reducing symptoms of illness, improving mental health, and training self-care behaviors (10). Chamany et al. conducted a telephone intervention to improve diabetes control. The results indicated that a telephone interview could be an effective clinical tool for promoting diabetes control (25). Tavşanlı et al. conducted a study on the use of telenursing video technology to control blood sugar in diabetic patients. This relationship was statistically significant. The study showed that visual contact could be useful in controlling blood glucose (26). Hoyer et al. conducted a study to examine the nurse's telephone follow-up by the nurse on the life quality of women with breast cancer after radiation therapy. After the analyses, there was a significant difference between the control group and the experience in terms of quality of life (27). Kimman et al. conducted a study entitled “The effect of telephone follow-up by the nurse on patient satisfaction after treatment of breast cancer in the Netherlands”. The results of this study showed a significant difference between the two groups of control and case in terms of satisfaction (28). Borhani et al. (29), conducted a study concerning the effect of telecommunications nursing (mobile application program) on glycosylated blood glucose in patients with type 2 diabetes (29). Sadeghi et al. conducted a study entitled “The effect of nurse telephone follow-up on glycosylated hemoglobin in diabetic patients”. The results showed that telenursing follow-up reduces glycosylated hemoglobin in diabetic patients and is an effective way to improve their hyperglycemia (30). Kim and Kim examined the effectiveness of cell phones and Internet in patients with type 2 diabetes to obesity in Korea. The purpose was to study the effect of telephone follow-up on weight loss and maintaining blood sugar levels close to normal range. The results showed that HBA1C levels decreased in the intervention group compared to baseline levels after one year (31). Articles data has been show in Table 1. 1 Zakerimoghadam The effect of telephone follow-up by the nurse (telenursing) on the compliance of diabetic diet in type 2 diabetes patients (9). 2008 Semi-experimental clinical trial 60 Patients with Type II Diabetes Referring to the Iranian Diabetes Association Chi-square test showed statistically significant differences (P = 0.035) between two intervention and control groups in adherence to the diet after the intervention and independent t-test after the intervention showed statistically significant differences (P < 0.0001) between the two groups in terms of glycated hemoglobin. 2 Sadeghi The effect of telephone and SMS follow-up on the quality of life of patients after heart valve replacement surgery (19). 2014 Experimental clinical trial 99 Patients undergoing heart valve replacement surgery in selected hospitals in Tehran ANOVA showed no significant differences between the mean score of quality of life in the groups before and after the intervention (P < 0.001). 3 Shojaie The effect of patient education and telephone follow-up by nurse on remission, anxiety and hope in patients with heart failure (20). 2013 Experimental clinical trial 189 Patients admitted to Shahid Rajaee Heart Center and Baqiyatallah Hospital in Tehran After the intervention, there was a significant difference between the anxiety means in all groups (P = 0.000). 4 Imani The effect of nursing informing through telenursing on the family anxiety level in patients admitted to the intensive care unit (21). 2015 Semi-experimental clinical trial 35 Family of Patients Admitted to the ICU in Imam Khomeini Hospital, Ilam City Wilcoxon test showed a statistically significant difference between the mean of anxiety before and after the first call, before and after the second call, before and after the third call, and before and after the end of the intervention (P < 0.001). 5 Wong The effect of telephone follow-up by nurses on the degree of self-esteem of patients with chronic obstructive pulmonary disease” in Hong Kong (22). 2005 Experimental clinical trial 60 Referring to respiratory disease clinics in Hong Kong The results showed a significant increase in self-esteem score in the post-test in the intervention group compared to the pretest (P < 0.01). 6 Fakharzadeh The effect of telenursing on glycosylated hemoglobin and anthropometric indices of type 2 diabetic patients (23). 2013 Experimental clinical trial 64 Patients with type 2 diabetes referring to diabetes hospital in Ahvaz Golestan Hospital Their results showed that the mean glycosylated hemoglobin and body mass index (BMI) in the case group after the intervention significantly decreased before intervention (P > 0.05), but no significant differences were in the control group (P < 0.05). The mean of waist-to-hip ratio before and after intervention in the case and control groups was not significantly different (P = 0.70 and P = 0.40, respectively). 7 Behzad The effect of telenursing-based empowerment program on self-efficacy in elderly with hypertension (24). 2016 Experimental clinical trial 88 Elderly with hypertension referring to Shirazi clinic of Gorgan city The result of the independent t-test showed no significant difference between the level of self-efficacy before intervention in the test and control group (P = 0.44). 8 Chakeri Telephone follow-up (telenursing) by the nurses for patients diagnosed with lung cancer (10). 2014 Semi-experimental clinical trial 299 Patients in Dutch hospitals have been selected Telenursing in patients diagnosed with lung cancer increased the patients' satisfaction in reducing symptoms of illness and promoting their mental condition. 9 Chamany Telephone intervention to improve diabetes control (25). 2015 Experimental clinical trial 941 Patients with diabetes intentionally outnumber the Latin South of Brussels in New York The results indicated that a telephone interview could be an effective clinical tool for promoting diabetes control. 10 Tavşanlı The use of videophone technology (telenursing) in the glycemic control of diabetic patients (26). 2013 Experimental clinical trial 48 Turkey The study showed that visual contact could be useful in controlling blood glucose. 11 Hoyer The nurse's telephone follow-up by the nurse on the life quality of women with breast cancer after radiation therapy (27). 2011 Semi-experimental clinical trial 100 Women with breast cancer in the radiation section at the Danish hospitals After the analyses, there was a significant difference between the control group and the experience in terms of quality of life. 12 Kimman The effect of telephone follow-up by the nurse on patient satisfaction after treatment of breast cancer in the Netherlands (28). 2010 Experimental clinical trial 16 Women diagnosed with breast cancer in step 1, 2 or 3 at Las Neus Hospital in Spain and then discharged The results showed a significant difference between the two groups of control and case in terms of satisfaction. 13 Borhani The effect of telecommunications nursing (mobile application program) on glycosylated blood glucose in patients with type 2 diabetes (29). 2013 Experimental clinical trial 60 Patients referring to the endocrine department of Valiasr Hospital in Tehran The results showed a significant difference between the two groups of control and case in terms of satisfaction. 14 Sadeghi The effect of nurse telephone follow-up on glycosylated hemoglobin in diabetic patients (30). 2010 Experimental clinical trial 70 Patients covered by Rafsanjan Diabetes Clinic The results showed that telenursing follow-up reduces glycosylated hemoglobin in diabetic patients and is an effective way to improve their hyperglycemia. 15 Kim The effectiveness of cell phone and internet in patients with type 2 diabetes 2 obesity in Korea (31). 2008 Semi-experimental clinical trial 34 Patients with type II diabetes referred to Korean Hospital Endocrinology Clinic The results showed that HBA1C levels decreased in the intervention group compared to baseline levels after one year. 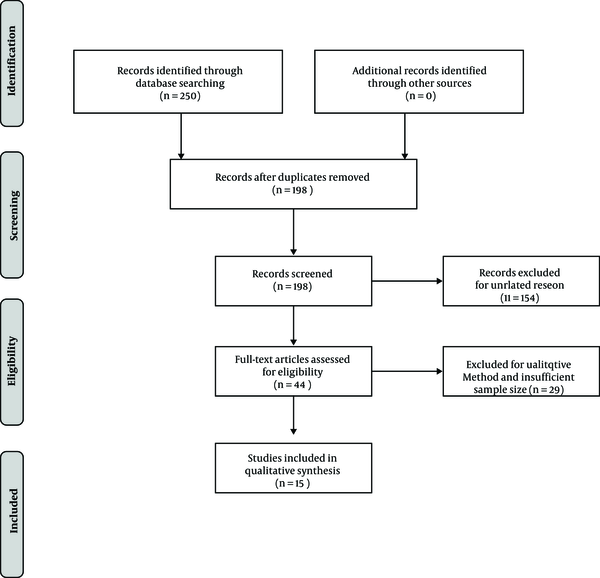 The purpose of this systematic review was to examine the scope of telenursing uses and its being effective or not, and by examining the studies we found that telenursing is used in educational, clinical, and psychological areas and is economically cost effective. Today, telephone technology is available in most homes and is easy to use; it is recommended that this technology be included in the care-education sphere by the nurses (21). Nurses are an important member of the health care team. Nowadays, due to the increase in number of patients with chronic diseases, and the development of communications and internet connections, and so on, the need for trained nurses is considered more vital than to provide nursing services in different ways as well as remotely. Educational area: One of the areas of telenursing use is in the field of patient education. The role of education and counseling is evident in the study by Javaheri Tehrani and Nikpour Education is effective in promoting self-efficacy and health behaviors (32). Behzad et al. states that “Telenursing offers an opportunity to sustain and improve the educational process and change the behavior of health and ultimately ends in improved quality of care” (24). The main philosophy in controlling chronic diseases is focusing on empowering and engaging the patient in self decision-making. Although the treatment team provides the patient with a care program, the patient is the one to implement the treatment regimen. The patients need time to comply with the disease and learn to change their lifestyles; in addition, they need constant monitoring of their ability to care for themselves (9). Fakharzadeh et al. states that follow-up for establishing effective and dynamic care relationship increases awareness, enhances performances, and reduces complications (23). Yates states that as the lives of people with chronic diseases turn hard by problems such as decreased function, disability, persistence of anxiety and dissatisfaction, annoying symptoms, periods of recurrence of disease, and fear of death, these factors may make the patients with chronic illness understand hope in a different way from healthy people (33). In the study by Shojaei et al. due to the educational-support role, telenursing has a role in increasing the hope of the patients. Stating a relationship between promotion of self-care behaviors and patient support as well as hope can be increased in the patient with improved care and support (20). Fakharzadeh et al. states that in person follow-up by the patient, compared to telephone follow-up, needs more time and money, which makes it possible that the patients don’t end up going to their follow-up meetings (23). Telenursing provides patients with education without time and place limitation. By using this method, the patient does not need to travel long distances, thus, reducing the cost of treatment (4). The researcher had limited access to the database as well as full text of some articles. Examining the studies shows that telenursing has been effective in changing the symptoms related to the patients’ health. Hence, telenursing technology can be used in clinical areas to enhance mental health and education, and to promote self-care behaviors. Authors' Contribution: Mohammad Esmaeilpour Bandboni's role was to design study, analyze, interpret, prepare the drafting of the paper and review it. Faezeh Ghoulami-Shilsari is the author of the article, the compilation of the article data, analysis and interpretation of the article's data, an active role in writing the article and endorsing the final edition of the paper, taking on public and common responsibilities of the article. Funding/Support: Guilan University of Medical Sciences funded this research. 1. Forouzi M, Ali Mirzaei R, Dehghan M, Heidarzadeh A. [Evaluation of clinical skills of nursing students in intensive care units]. J Nurs Educ. 2017;6(6):58-64. Persian. 2. Azarbarzin M. [The evaluation of some academic nursing lessons application in clinical practice from recruiting nurses' point of view in some selected hospitals in Isfahan]. Strides Dev Med Educ. 2008;4(2):125-32. Persian. 3. Banaderakhshan H, Mehrabi YSY, Mortazavi F, Saedi N. [Comparing knowledge, attitude and practice of senior nursing students and graduates of Shahid Beheshti University of Medical Sciences]. Res Med. 2005;29(1):37-43. Persian. 4. Maserat E, Samadi N, Mehrnosh N, Mohamadi R, Zali M. [Tele nursing: An appropriate option to improve patient education]. J Ardabil Univ Med Sci. 2012;13(3):47-52. Persian. 5. RajabFaridni H. [The effect of nursing telephone follow up on dietary obstinacy in hemodialysis patients in hemodialysis department of Imam Jafar Sadeq Hospital in Aligudarz] [dissertation]. Khorasgan: Islamic Azad University of Khorasgan Branch; 2012. Persian. 6. Pena V, Watson AJ, Kvedar JC, Grant RW. Mobile phone technology for children with type 1 and type 2 diabetes: A parent survey. J Diabetes Sci Technol. 2009;3(6):1481-9. doi: 10.1177/193229680900300630. [PubMed: 20144404]. [PubMed Central: PMC2787050]. 7. Greenberg ME. A comprehensive model of the process of telephone nursing. J Adv Nurs. 2009;65(12):2621-9. doi: 10.1111/j.1365-2648.2009.05132.x. [PubMed: 19941546]. 8. Vasquez MS. Down to the fundamentals of telehealth and home healthcare nursing. Home Health Nurse. 2008;26(5):280-7. quiz 288-9. doi: 10.1097/01.NHH.0000318943.62538.0a. [PubMed: 18469601]. 9. Zakerimoghadam M, Bassampour S, Rjab A, Faghihzadeh S, Nesari M. [Effect of nurse-led telephone follow ups (tele-nursing) on diet adherence among type 2 diabetic patients]. Hayat. 2008;14(2):63-71. Persian. 10. Chakeri A. [The effect of nursing consultation on the quality of life of cancer patients referring to selected hospitals of Tehran University of Medical Sciences] [dissertation]. Tehran: Islamic Azad University centeral Tehran Branch; 2013. Persian. 11. Goodwin S. Telephone nursing: An emerging practice area. Nurs Leadersh (Tor Ont). 2007;20(4):37-45. doi: 10.12927/cjnl.2007.19470. [PubMed: 18303723]. 12. Kumar S. Introduction to telenursing. Telenursing. Springer; 2011. p. 1-3. 13. Nabavi SH, Alipoor F, Hejazi A, Rabanie E, Rashidi W. [Relationship between social support and mental health in older adults]. J Mashad Univ Med Sci. 2014;57(7):841-6. Persian. 14. Nazari H, Rashedi V, Mohammadi H, Yousefi M. [Relationship between cognitive status and activities of daily living among the elderly of nursing homes]. J Kermanshah Univ Med Sci. 2015;18(12):744-6. Persian. 15. Barry PP. An overview of special considerations in the evaluation and management of the geriatric patient. Am J Gastroenterol. 2000;95(1):8-10. doi: 10.1111/j.1572-0241.2000.01697.x. [PubMed: 10638552]. 16. Gosselin S, Desrosiers J, Corriveau H, Hebert R, Rochette A, Provencher V, et al. Outcomes during and after inpatient rehabilitation: Comparison between adults and older adults. J Rehabil Med. 2008;40(1):55-60. doi: 10.2340/16501977-0144. [PubMed: 18176738]. 17. Lee HJ, Park H. Telephone inquiries to the ophthalmology nursing unit and nursing interventions through telephone consultations. J East-West Nurs Res. 2009;15(2):157-67. 18. Civilica. The International Symposium on Electronic Hospital and Telemedicine. Tehran: Civilica; 2016, [cited 2018 November 29th]. Persian. Available from: https://www.civilica.com/Paper-TELEMEDICINE01-TELEMEDICINE01_063.html. 19. Sadeghi M, Ghafori F, Tadrisi D, Tayebi A. [The effect of telephony and SMS follow up on quality of life in patients undergoing heart valve replacement surgery in selected hospitals in Tehran]. Iran J Crit Care Nurs. 2014;6(1):72-65. Persian. 20. Shojaie A, Nahir B, Nadery N, Zarean A. [The effect of patient education and telephone follow up by nurse on hopefulness of heart failure patients]. J Nurs Educ. 2013;2(1):16-26. Persian. 21. Imani A, Dabirian A, Safavibiat Z, Payandeh A. [Examining the impact of nurse notification by phone (telenursing) on anxiety level of hospitalized patient's family in intensive care unit]. Iran J Nurs Res. 2015;9(4):22-8. Persian. 22. Wong KW, Wong FK, Chan MF. Effects of nurse-initiated telephone follow-up on self-efficacy among patients with chronic obstructive pulmonary disease. J Adv Nurs. 2005;49(2):210-22. doi: 10.1111/j.1365-2648.2004.03280.x. [PubMed: 15641953]. 23. Fakharzadeh L, Shahbazian H, Salehinia H, Yaghoobi M, Haghighizadeh M, Karandish M. [Effect of telenursing on glycosylated hemoglobin (HbA1c) and anthropometric indexes in type 2 diabetic patients]. Modern Care J. 2013;10(2):101-7. Persian. 24. Behzad Y, Bastani F, Haghani H. [Effect of empowerment program with the telephone follow-up (tele-nursing) on self - efficacy in self-care behaviors in hypertensive older adults]. J Urmia Nurs Midwifery Fac. 2016;13(11):1004-15. Persian. 25. Chamany S, Walker EA, Schechter CB, Gonzalez JS, Davis NJ, Ortega FM, et al. Telephone intervention to improve diabetes control: A randomized trial in the New York city A1c registry. Am J Prev Med. 2015;49(6):832-41. doi: 10.1016/j.amepre.2015.04.016. [PubMed: 26232903]. [PubMed Central: PMC4656092]. 26. Tavşanlı NG, Karadakovan A, Saygili F. The use of videophone technology (telenursing) in the glycaemic control of diabetic patients: A randomized controlled trial. J Diabetes Res Clin Metabol. 2013;2(1):1. doi: 10.7243/2050-0866-2-1. 27. Hoyer BB, Toft GV, Debess J, Ramlau-Hansen CH. A nurse-led telephone session and quality of life after radiotherapy among women with breast cancer: A randomized trial. Open Nurs J. 2011;5:31-7. doi: 10.2174/1874434601105010031. [PubMed: 21660182]. [PubMed Central: PMC3109608]. 28. Kimman ML, Bloebaum MM, Dirksen CD, Houben RM, Lambin P, Boersma LJ. Patient satisfaction with nurse-led telephone follow-up after curative treatment for breast cancer. BMC Cancer. 2010;10:174. doi: 10.1186/1471-2407-10-174. [PubMed: 20429948]. [PubMed Central: PMC2880988]. 29. Borhani F, Ranjbar H, Abbaszadeh A, Abazari F, Ranjbar A. [The effect of telenursing (Cellphone software) on A1c hemoglobin in patients with type 2 diabetes mellitus]. J Army Univ Med Sci. 2013;11(2):130-7. Persian. 30. Sadeghi T, Sahabinejad M, Derakhshan R, Balaii P. [Effect of nurse - led telephone fllow up (Tele nursing) on HbA1c among diabetic patients]. J Rafsanjan Univ Med Sci. 2010;9(3):184-75. Persian. 31. Kim SI, Kim HS. Effectiveness of mobile and internet intervention in patients with obese type 2 diabetes. Int J Med Inform. 2008;77(6):399-404. doi: 10.1016/j.ijmedinf.2007.07.006. [PubMed: 17881285]. 32. Javaheri Tehrani F, Nikpour S. Effect of health on knowledge, self-efficacy and health behaviours of women with urinary tract infection. Int J Urolog Nurs. 2014;8(1):3-14. doi: 10.1111/ijun.12026. 33. Yates P. Towards a reconceptualization of hope for patients with a diagnosis of cancer. J Adv Nurs. 1993;18(5):701-6. doi: 10.1046/j.1365-2648.1993.18050701.x. [PubMed: 8514925].